B11, Kings Festival is in many ways the opposite of B10-Night’s Dark Terror, rather than a sprawling journey with somewhat loosely connected parts and many side adventures, King’s Festival is narrowly focused and very tiny in scope. It is perhaps too tiny, and too simple to be remotely useful. This isn’t to say that King’s Festival is worthless, much of the adventure is a set of play aides and advice, and as these things go the advice and aides are both moderately useful. The module itself is nicely written and has a few good touches, with solid description and scene setting, unfortunately the descriptions and scene are also terribly boring in King’s Festival, and the module has this feeling of being risk adverse and washed out. This lack of setting and evocative detail (there is an excess of detail, it’s just not evocative) is so prevalent that B11 is a dull, clichéd fantasy adventure doomed to fail as a an introduction to table top roleplaying games because it manages drains every bit of the fantastical, weird and awesome out of the genre. 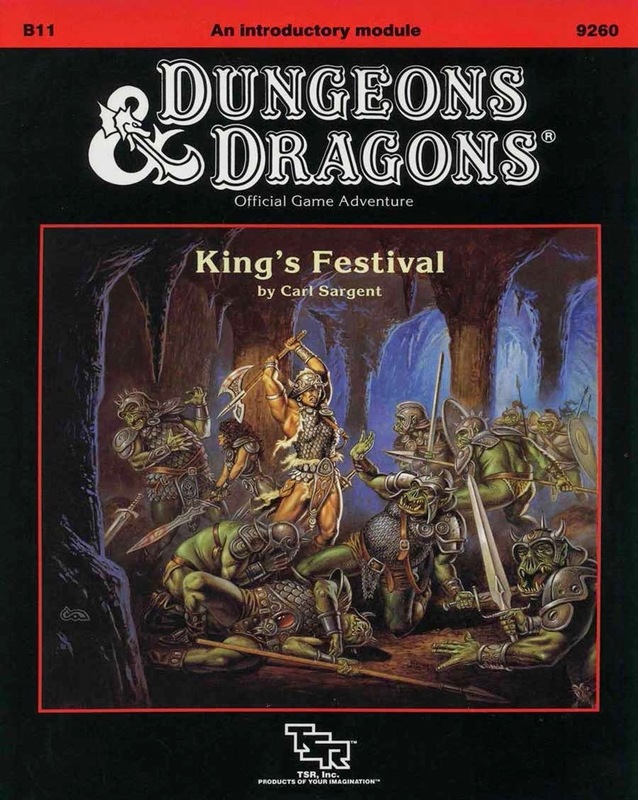 King’s Festival is firmly in the late period of TSR products, written in 1989 by Carl Sargent, and it is a far more polished product then any adventure preceding it in the ‘B’ Series. By 1989 it seems that TSR had abandoned the heroic story arc model of the Dragonlance Modules at least to a degree, as King’s Festival is not a merciless railroad. This may be because it is too small to be a railroad, consisting of a single location, but the GM advice in the first 10 pages doesn’t seem to encourage too much fidelity to a specific story. Instead B11 uses alignment and the call for a heroic struggle against chaos as it’s justification for expecting and encouraging specific player actions. There is something potentially interesting here, but again the blandness of the setting in Kings Festival remove any reason to contemplate or explore any potential here. A new pack of scavengers, some still salt and sunburned from being pulled aboard the Apollyon and others with the hollow eyes of gaol habituates are escorted through the bustling central market of Sterntown, a neighborhood normally denied to them. The destination of the armed and armored scavenger gang is the Steward ramparts above the “Fetid Pit”. The revetments are sparsely manned, but bristle with flame sluices, spiked barricades, organ guns, arc lamps and volley darters all aimed down into the yawning air shaft that serves Sterntown as a sewer and chemical dump. Told that they must descend by climbing a great chain dangling above the pit to recover valuables the scavengers look down. The ramparts are a tiny brightly lit and protected refuge in the wall of a vast shaft. Gray light trickles from far above, cut by the slow progress of titanic fans and dappled by a veritable jungle of fungus, molds, lichens and plants reaching for the light. Below the first hundred feet have been cleared to the oddly terrace hull metal, likely by the application of chemical and other industrial wastes, but beyond the vertical jungle begins again: pale spiny bromeliads the size of trees, dense tangles of black vines spouting tiny leaves, and a lurid variety of bright fungus. The grey light fliters down only 200’ feet revealing some sort of installation near the descent chain, but beyond is only blackness and flashes of bioluminescence. At the very bottom of everything, the well stretching skyward, with the surface as distant as the radiant heavens of the Bother Gods, and for us equally unobtainable we took stock of who had survived slaughter by the maggot skinned beasts. We sat around a meager fire making biscuits from the weevil rich flour whose sacks had been torn in the combat. Our only protection was a low roof of stone held by a myriad of pillars, an edifice much like a pier, but rising from the smooth dry stone of the cave. As we sat, men and woman first tried to find those of their own country, or those who had made up the cliques and gangs in the camps above. The grim descent and the fight afterward had scattered and broken these chains of the past. Amid the abattoir of our fellows, torn by the deep beasts, the past seemed less important then before, a rebirth from a womb of light and space into a place where darkness has twelve distinct varieties. I found myself using the blade of the ax I had grabbed up in desperation to help the man next to me heat his doughy biscuits as well as my own. He was a lean and ageless man, and from his ragged robes I knew him to once have been a noble from the distant islands across the spotted sea. From the scars of torture and the brands on his hands I also knew him to have been a sorcerer, who had somehow survived the special attentions of the Crusaders. He called me "Ax" from that day, and we became friends there. I for my part always called him as "Titter" from his strange laugh - in our own lands we would have clung to our proud traditions and he insisted on his title and honorifics while I demanded he respect the honors I once won in the City of Glass. - Testimony of fallen redeemer No. 34 at the Inquisitional inquest regarding the White Fortress massacres. I was thinking again about running a 'company style' game, where the player select from a large pool of potential characters, but do not each 'own' a specific character. 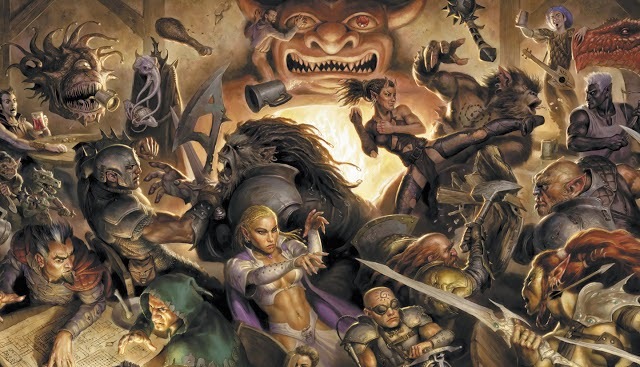 Obviously generating PCs quickly is essential in such a game, and as mentioned in previous posts on the subject the goal is to have a varied party of 'adventurers' each session with a trade off between leaving the best company members in camp or using them as characters in a specific session. While stat lines can be generated quickly, and equipment becomes more a function of company stores then individual record sheets, I wanted to add a bit more to character generation so that the company members, most who will be little more then replacements or NPCs could be a bit more memorable. To this end, below is a table of 100 Nicknames and Traits, many of which also adjust statistics so that a player will have something to go on when starting with a new PC. Thouls and Owlbears oh my! Inspired by Hereticwerk’s 6 Tigers and 6 Lions of Wyrmspittle here’s 10 Owlbears and 10 Thouls. Owlbears and Thouls have a special place in mid -80’s D&D, showing up in a large number of the B-series modules that I have been reviewing. I like both these monsters, they are D&D originals, the owlbear (like the bullette and rust monster) is one of those early D&D beasts based on a set of plastic ‘dinosaur’ toys, and the thoul is an absurd horror seemingly designed as a mechanically infuriating trick monster with several special abilities and very poor justification of them. Owlbears are the embodiment of bestial fury for low level adventuring parties, a dumb brute capable of tearing apart anyone foolish enough to stand against it in melee combat. The Thoul is more mysterious, some kind of goblin undead super-soldier or strange hybrid goblinoid. I think Thouls exist primarily as a means to trick parties who gleefully set about massacring humanoids, but there's a place for them as some kind of altered goblinoid: undead, enchanted, possessed, mechanically augmented - whatever goblins are into in a setting culminates in a Thoul. Below are the stat blocks for both creatures along with the descriptions taken from the Moldvay Basic Rules. An owl bear is a huge bear-like creature with the head of a giant owl. An owl bear stands 8' tall and weighs 1500 pounds (15,000 coins). Owl bears have nasty tempers and are usually hungry, preferring meat. If both paws of an owl bear hit the same opponent in one round, the owl bear will "hug" for an additional 2d8 points of damage. 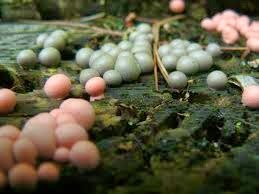 They are commonly found underground and in dense forests. 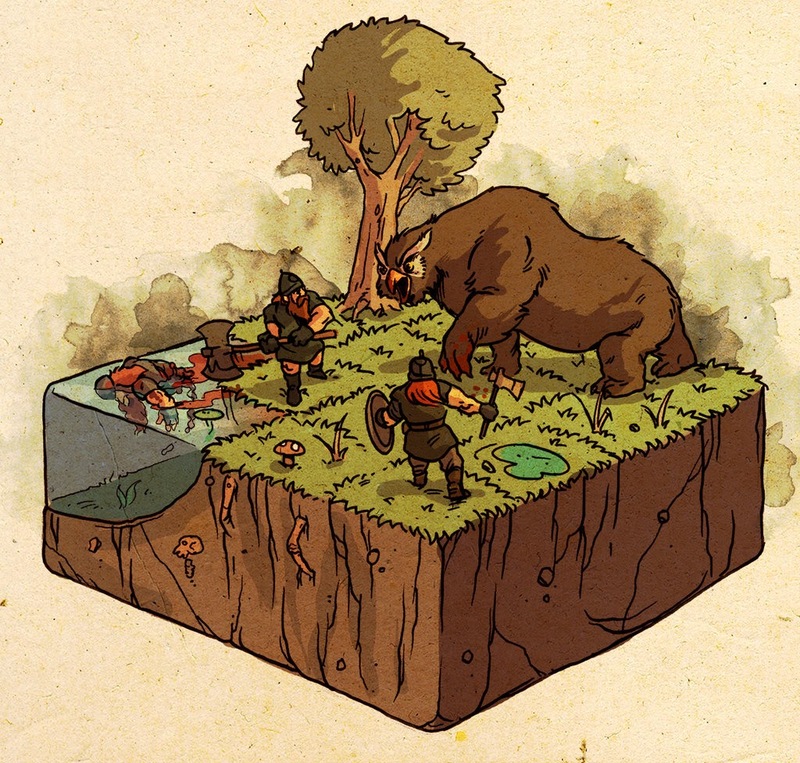 The above stat blocks don’t tell the reader much about the glory of the Owlbear or the Thoul and as creatures without a mythical basis, there’s really nothing else to go on. One of the saddest things in a tabletop game is when monsters lose their terror and mystery and become simply stat block. This is a problem with the late period TSR modules, and one that I personally find make me want to stop playing a game. A monster should have a description and evoke wonder rather then simply be a set of mechanical challenges. Below are ten new descriptions of Thouls and ten descriptions for Owlbears that don’t qualify as reskinning but are hopefully more flavorful then the ones above and allow the monsters to be use in a variety of settings. Here's a Map I won't be using for anything. Have at it. 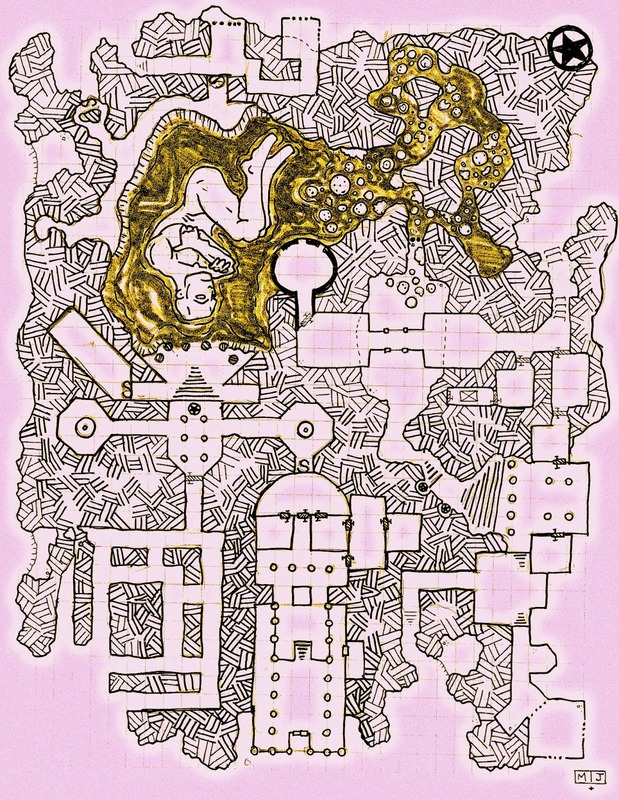 If it looks familiar perhaps it's because it's a version of the 'fill in' map by Matt Jackson (Lapis Calumni) for Tenkar's Tavern's OSR Superstar Contest. After the mess that is Castle Cadwell and Beyond it’s been hard to review another B-series module. Luckily B10 “Night’s Dark Terror” is an excellent module, viewed by some as the best of TSR’s. Certainly it’s up there in any ranking of old or new adventure supplements, and it's very good. 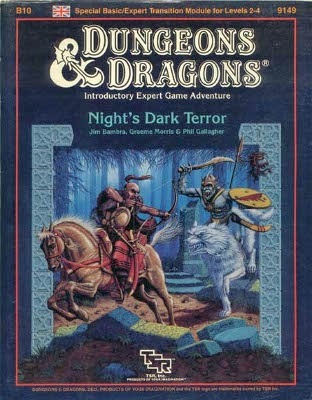 Dark Terror is a directed sandbox module, meaning that it’s a sandbox of various placed encounters that starts with and contains several set pieces. I think the difference between this and the much maligned railroad is that the events and encounters in Dark Terror don’t really depend on a specific set of player actions, they simply exist within the context of the region the module describes during the time the party is there. B10 was written by a stellar set of British game designers, Graeme Morris (worked on the UK series of modules), Jim Bambra and Phil Gallagher (the writer for Death on a Reik and the other Warhammer Fantasy Enemy Within modules) in 1986, that is a couple of years after TSR has seriously latched on to the heroic epic railroad variety of module and was fully at the height of its popularity. Yet, B10 is closer to Keep on the Borderlands then it is Horror on the Hill (two modules that are basically the same adventure done alternatively in Gygaxian naturalist and mid-TSR proto-railroad style). In a sense, B10, by breaking from the dungeon crawl focus of early D&D while renouncing the railroad/story-line module of late D&D and is I think a very good model for the best of the ‘OSR’ products of today. The only major peculiarity of B10 as it relates to the rest of the B-Series is that it is for character levels 2-4. Rahasia also suggests a level 2 party, but seems less focused on this. Dark Terror really does try to push the players and GM from the dungeon crawls of the Mentzer Basic set to the wilderness adventure of the Blue Box Mentzer Expert set. B10 wants to ease the party into wilderness exploration and the idea of becoming regional power brokers. Yet Dark Terror is its own thing, and really succeeds on almost every level, except when it strays too far into trying to make the players follow a certain path and neatly tie up loose ends from earlier sections of the adventure. B10 has an evocative, but still rather vanilla D&D setting, a nice way of introducing/using wilderness rules and a real sense of exploration. 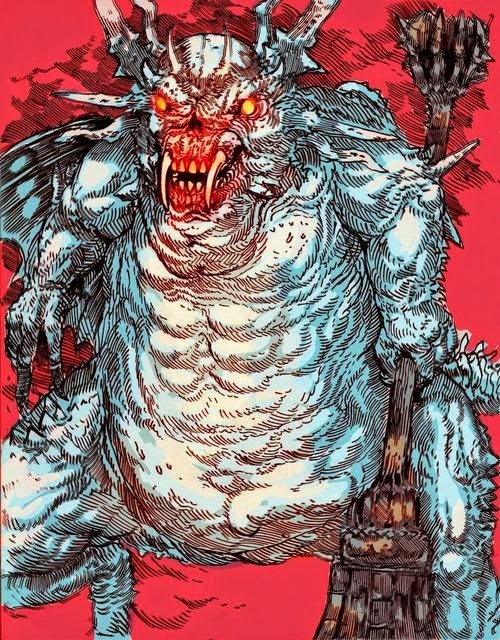 In the recent online discussion of monster design, partially inspired by my Trick Monster post earlier this week, I’ve crystalized a few of my views on designing monsters for the type of battlemap free OD&D I prefer. I find trying to use exact positioning and even calculated missile range hard to do in the context of an active game. Early D&D shows its wargame roots though, adopting distances and strict movement ranges without examining these choices. These rules have always frustrated me, and like many others I’ve largely ignored them. The issue then is how to better make use of the abstract elements and to create the same sort of tactical considerations and tensions without any sort of concrete or empirical spatial considerations. Specifically, I want to look at rules for two kinds of special attackers that are extremely dangerous and should likely be treated similarly, Dragon Breath weapons and artillery (or any kind of heavy siege weapon really). 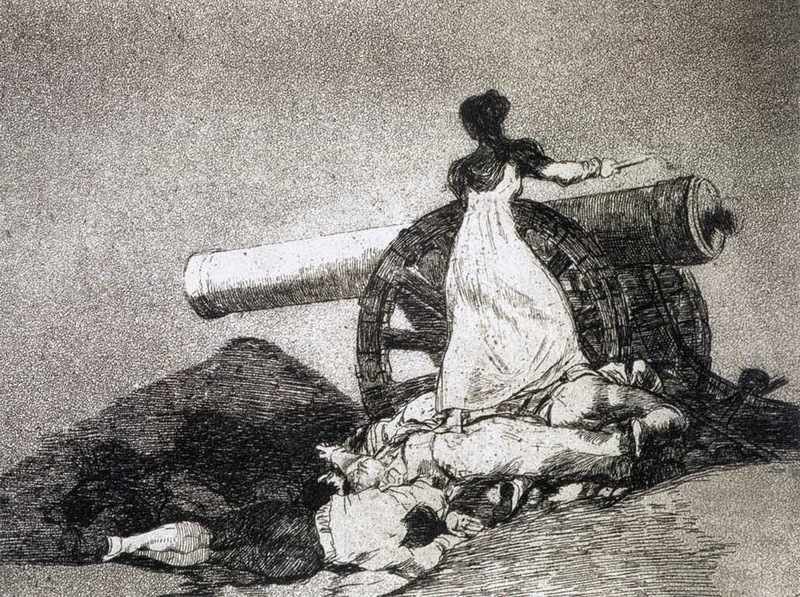 Goya, Disasters of War I Think. The first consideration is range, as there needs to be some consideration for range to keep tactical options open, but breaking it into broad classifications is better for my goals than tracking combat movement. This treatment of rsnge may seem cursory and makes closing range easy, but given that the majority of D&D combat happens in poorly lit mazes of 10’ wide stone corridors I think it will serve. Range should be determined by movement and in an abstract tabletop game combat movement is really only important in attempting to flank, charge, and most important for retreat. I think a simplification (one I am undoubtedly stealing from someone) of movement into a value from 1-6 and treating it similarly to a specialist skill for difficult combat movement, while using opposed rolls for flight, is appropriate. Since the unarmored D&D human, or at least most humanoid monsters in the old monster manual, seem to have a movement rate of 40’, setting ‘movement’ at 4 of 6 seems about right. Being encumbered or wearing armor one lacks skill in using reduces movement by ‘1’ point per level of armor (light, medium, heavy) or based on the level of encumbrance. Thus a magic-user wearing plate armor has a movement of 1, meaning they move very slowly. Movement works two ways, first in combat and second in pursuit. My range categories (below) consists of five basic combat ranges (Grappling, Melee, Short, Medium and Long) and it takes a movement value of 2 to close one increment of range, or to attack (though attack ends any movement). Likewise most actions take 2 movement points (swapping weapons or removing something from a pack for example) Charging allows an attack at the end of a full movement (meaning an attacker can charge from medium range to attack with associated penalties and bonuses). Unless someone is actively trying to impede this movement in combat or the movement is tricky (pushing past allies into the front line) there’s no need to roll, but if there is a doubt about the viability of the movement a roll on a 1D6 under the movement value should suffice. The reason I am simplifying movement to this extent isn’t just practicality, it’s because removing specific distances creates abstraction and should help with arguments about what a ‘real’ character could or couldn’t do, in the same way the abstraction of hit points decreases the number of arguments about character injury and death. I think this simplified movement will work well in pursuit scenarios, as the runner and the pursuer can each roll a movement check on a D6 and the amount of success or failure creates a number representing distance gained or lost between the pair in that round of flight. So Tenkar Tavern's OSR Superstar contest continues. I've made it to the 3rd round,and decided to put my winning monster submission up below. "The Robbers’ Bride a nightmare of settled man, the keening memory of a kidnapped daughter and the shadow of a wife fled into the night. To the vagabond, the proscribed, the outcast and the criminal they are the manifestation of hopes and dreams. Robbers’ Brides appear both as the motherly prophets of blood-soaked wilderness brigand bands and as the child saints of the urban underworld. These thieves’ oracles been reported to hold court in the low dens of tomb robbers and self-proclaimed ‘Adventures ‘, where these murder and gold crazed vagabonds pay homage to them as voices of true prophecy." The One Page Dungeon Contest also ended this week, and Dungeon of Signs Thunderhead Manse managed to make it to the final round.